The Stanley Bostitch MCN – 150 StrapShot Metal Connector nailer is a compact lightweight nailer (4.6 pounds), fitted with a rubber comfort grip; meaning that Bostitch MCN 150 is 50% lighter than competitive models for reduced fatigue and added maneuverability. Are you hanging a picture on a wall or putting together a bookcase? A hammer is a perfect tool for that. Building a house and also installing hardwood floors or planning to put up a furniture repair shop? Then you’ll need a nail gun because a hammer won’t be enough. Decking floors and ceilings? A joist hanger nail gun is also your best buddy. Joist hangers are designed to hold timber joints in place. it will also keep the decks and floors strong as the wood ages over time. Installing them properly requires the best nailer and we know also just the right one for you. More than that, it is equipped with an integrated fastener feeding system, as well as an exposed nail tip design to prevent misfires. And to assure fast and quick but also accurate and precise nail placement or application. This nailer has a built-in safety that forestalls the tool from firing when not placed properly into the connector hole, and it comes with hardened steel wear guards to protect the tool, and an adjustable exhaust to conveniently direct air away from the user. This nailer ranks among the best in its category and is also offered at a really reasonable price. 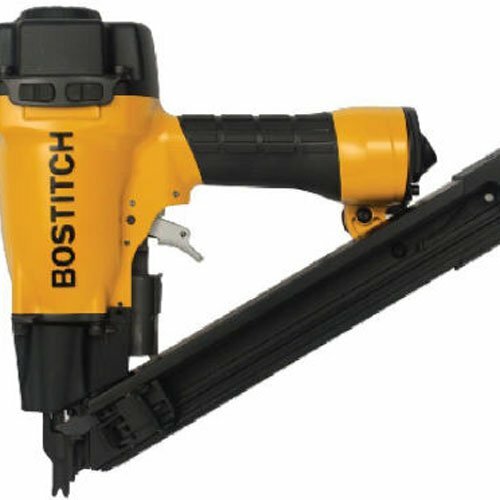 Bostitch STRAPSHOT Metal Connector Nailer (MCN 150) is designed to be compact and also lightweight for comfortable long hours of work. The rubber comfort grip also contributes to a comfortable work time on projects. It has also a built-in safety feature that prevents misfires and an exposed nail tip for a more precise application. On the other hand, the only disadvantages we could notice on this Bostitch drill are the plastic closers that might break easily. One must be careful while handling this tool. In addition, it is important to note that this nail gun cannot handle cold weather very well and will lose efficiency below 30 degrees. Other than that, the Bostitch MCN 150 Metal Connector Nailer’s speed and performance are unquestionable. Who should buy the Bostitch MCN-150? In addition, The Bostitch MCN-150 StrapShot nailer comes with a carrying case. As far as the warranty is concerned, you can be totally assured, this Stanley Bostitch MCN-150 nailer is backed by a 7-year limited warranty also. We have also gathered for you what other people who bought or used this Bostitch nail gun have said about it. The BOSTITCH MCN 150 StrapShot Metal Connector Nailer is compact lightweight and yet very powerful and also will undoubtfully provide a great added value. It is also suitable for practically everyone, and it can be used to attach different metal connectors professionally. So Now, We think it is one of the best nail guns in the market, offered at almost half the price of comparable tools. It has an undeniably high price-to-quality ratio. We crawl the web regularity to find the best price/reliability ratio for the products you need. So now, After extensive research, we recommend that you buy the Bostitch MCN 150 Nail Gun at Amazon, as they offer, in our opinion, the best price-to-reliability ratio.